Yahweh (יהוה) (ya•'we) is the primary Hebrew name of God in the Bible. Jews normally do not pronounce this name, considering it too holy to verbalize. Instead, whenever they encounter this unpronounceable string of consonants, (YHWH) they speak the name Adonai. Orthodox Jews strenuously avoid mentioning or even writing the divine name, preferring such circumlocutions as "the Holy One," "the Name," or the defective writing "G-d."
In Christian Bibles, Yahweh is usually translated as "the LORD," a rough equivalent to the Hebrew "Adonai." The Hebrew Bible indicates this reading by inserting the vowel pointing from the word Adonai on the consonants YHWH, rather than use the actual vowels. Based on a literal reading of this pointing (יְהוָֹה), many modern Protestant Christians read God's name as Jehovah. Elohim is the generic term for God in the Hebrew Bible, translated "God." Muslims refer to God as "Allah," which originates from the same etymological root as "Elohim." While the original concept of Yahweh may have been henotheistic (devoted to a single deity while accepting the possible existence of others) rather than monotheistic, the Hebrew prophets insisted that the Israelites must worship Him alone. Yahweh-centered monotheism eventually became the normative Jewish religion, and this in turn was inherited by both Christianity and Islam. In this sentence three names of God are used: Elohim (God), YHWH (the Lord), and El Shaddai (God Almighty). El Shaddai appears more than 30 times in the Hebrew Bible (Gen. 28:3; 35:11, etc.). Elohim, an honorific form of El, (Gen. 1:1, etc.) is used thousands of times. YHWH is used more than any other name for God in the Bible, nearly seven thousand times. In most editions, whenever the words "The Lord" are used, ancient Hebrew manuscripts have a form of YHWH. Other biblical sources, recorded in the Book of Genesis, suggest that God's name as YHWH was known from the earliest times; Genesis 4:26 says that men first called on "the name of YHWH" in the days of Seth, the third son of Adam and Eve. Abraham called on the name of the Lord at Bethel (Genesis 12:8), some four hundred years before the revelation to Moses. However, these mentions of YHWH in Genesis may be anachronisms. Evidence from biblical names suggests that the Israelites began using personal names bearing an element of the sacred name, such as yeho or yo at the beginning (e.g. Jehosaphat, Joshua), or yahu or yah and the end (e.g. 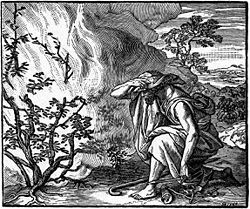 Elijah (Eliyahu)), only from Moses' day. The deity to whom Abraham offers his tithe after sharing this sacred meal with Melchizedek is “El Elyon,” a form of the God El. El was the chief God of the Canaanite pantheon in the second millennium B.C.E., and figures into many old Canaanite myths. 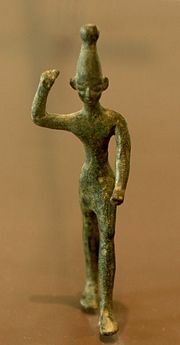 Later the more urbanized Canaanites replaced him with Baal as their chief God, but the Israelites were alien to these urban centers and identified with the people of the countryside who continued to worship El as the "highest god." Thus the residents of Salem, as well as other people of the region, knew the high god El. However, with regard to God as Yahweh, the Bible apparently reserves knowledge of the name to the chosen people. Biblical archaeologist Amihai Mazar finds that the association of Yahweh with the desert may be the product of his origins in the dry lands to the south of Israel. Several Biblical scholars have suggested that Yahweh originated with a group known as the Shasu, Canaanite nomads from southern Transjordan. An Egyptian inscription at Karnak from the time of Pharaoh Amenhotep III (1390-1352 B.C.E.) refers to the "Shasu of Yhw," evidence that this god was worshiped among some of the Shasu tribes at this time. Among the proto-Israelites may have been a group of Shasu who migrated northward into Canaan in the thirteenth century B.C.E. and settled in the Samarian and Judean hills . One Biblically-derived theory somewhat consistent with the above scenario holds that Yahweh was originally a deity of the Midianites and other desert tribes. The Exodus story tells us that the Israelites had not been worshipers of Yahweh—at least by that name—before the time of Moses. 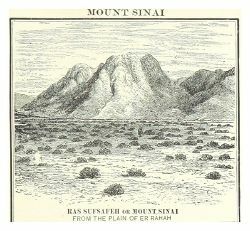 The revelation of the name to Moses was made at Sinai/Horeb, a mountain sacred to Yahweh, south of Canaan in a region where the forefathers of the Israelites were never reported to have roamed. Long after the Israelite settlement in Canaan, this region continued to be regarded as the abode of Yahweh (Judg. 5:4; Deut. 33:2; 1 Kings 19:8, etc.). Moses is closely connected with the tribes in the vicinity of this holy mountain. According to one account, Moses' wife was a daughter of Jethro, a priest of Midian (Exod. 18). When Moses led the Israelites to the mountain after their deliverance from Egypt, Jethro came to meet him, extolling Yahweh as greater than all other gods. The Midianite priest "brought a burnt offering and other sacrifices to God," and the chief men of the Israelites were guests at his sacrificial feast. It can be interpreted that because Jethro was a Midianite priest who offered sacrifices to Yahweh, the tribes in the region of Sinai/Horeb may already have been worshipers of Yahweh before the time of Moses. Early in the twentieth century, attempts were made to trace the West Semitic Yah back to Babylonia. Assyriologist Friedrich Delitzsch believed the name derived from an Akkadian god, Ia. A relation between Yahweh with Ea, also called Enki, one of the great Babylonian gods, has also been mentioned occasionally. However, scholars have largely abandoned this theory. Finally we should mention the theory first propounded by Sigmund Freud that Moses brought the “one God” idea with him from Egypt, having learned it from the Egyptian king Akhenaton, who attempted to make Egypt into a monotheistic society centering on the sun god. However, there is no evidence connecting Aten to the name Yahweh. The symbolic or spiritual meaning of God's name is the subject of debate in several religious traditions. In one of these, Yahweh is related to the Hebrew verb הוה (ha•wah, "to be, to become"), meaning "He will cause to become." In Arabic Yahyâ means "He [who] lives." A related Jewish tradition regards the name as coming from three different verb forms sharing the same root—YWH. The three words are: HYH (היה , haya, He was"); HWH (הוה, howê, "He is"); and YHYH (יהיה, yihiyê, "He will be"). This is believed to show that God is timeless. This formula has also been used by Christians to demonstrate the supposed trinitarian basis of God's existence. Another interpretation is that the name means "I am the One Who Is." This can be seen in the traditional account of God commanding Moses to tell the sons of Israel that "I AM (אהיה) has sent you" (Exod. 3:13-14). Other scholars believe that the most proper meaning may be "He brings into existence whatever exists" or "He who causes to exist," based on the causative (Hiphil) of the Hebrew root "to be." The ancient epithet Yahweh tseva'ot, usually translated "Lord of hosts," would thus originally mean "He who creates the armies of heaven." This interpretation brings out the theological concept of Yahweh as the Creator. The association of Yahweh with storm and fire is frequent in the Hebrew Bible. The thunder is the voice of Yahweh, the lightning his arrows, the rainbow his bow. The revelation at Sinai is amid the awe-inspiring phenomena of tempests. Scholars have also noted that many of these primitive characteristics of Yahweh are seen in hymns and inscriptions devoted to Baal of the Canaanites. This may have been due to the acculturation of Israelite religion into a region dominated by Canaanite culture, where Yahweh had to compete with Baal on his own terms (note the contest between Yahweh and Baal on Mount Carmel in 1 Kings 18). In fact, archaeologists and language experts indicate that it is difficult to distinguish Israelite and Canaanite culture until the early Early Iron Age, around the time of King David. We can imagine a situation in which some of the proto-Israelites worshiped a variety of gods, or worshiped God in a variety of forms using many names. Thus, Jeru-baal (Gideon)—was named for both Yahweh and Baal; while the Judge Shamgar ben Anath was named after the war goddess Anat. Saul, anointed by the Yahwist prophet Samuel as Israel's first king, nevertheless named two of his sons Ish-baal and Meri-baal. Many modern scholars believe that eventually, some of the characteristics of Yahweh, El, and Baal merged into Yahweh/Elohim. Baal, on the other hand, was denigrated and excluded, just as the bronze serpent icon associated with Moses (Num. 21: 9) was eventually destroyed as an idol (2 Kings 18:4). So too was the goddess Ashera disowned, while the chief deities of other ethnic groups were treated as having nothing in common with Yahweh. The issue is complicated by the question of whether the Israelites were truly one distinct people descended from Abraham who migrated en masse from Egypt to Canaan, rather than a confederation of previously unrelated people who came to accept a common national identity, religious mythology, and origin story. In any case, there is much evidence that the Yahweh-only ideology did not come to the fore among the Israelites until well into the period of Kings, and it was not until after the Babylonian exile that monotheism took firm root among the Jews. Yahweh himself was sometimes worshiped in a way that later generations would consider idolatrous. For example, presence of golden cherubim and cast bronze bull statues at the Temple of Jerusalem leads many scholars to question whether the Second Commandment against graven images could have been in effect at this time, rather than being the creation of a later age written back into history by the biblical authors. Describing an earlier period, Judges 17-18 tells the story of a wealthy Ephraimite woman who consecrates 1,100 pieces of silver to Yahweh to be cast into an image and put into the family shrine along with other idols. Her son then hires a Levite who serves as priest at the family's altar, successfully inquiring there of Yahweh on behalf of passing travelers from the tribe of Dan. The Danites later steal the idols and take them along with the priest to settle in the north. A grandson of Moses named Jonathan becomes their chief priest. 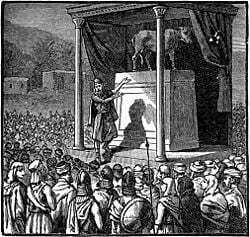 The tale serves as a precursor the later story of the northern king Jeroboam I erecting idolatrous bull-calf altars at Dan and Bethel in competition with the Temple of Jerusalem. English translations portray Jeroboam as saying "Here are your gods, O Israel" at the unveiling. The Hebrew, however, is "here is elohim," the same word normally translated at "God." Bull calves were associated with the worship of El, and bulls were routinely offered to Yahweh on horned altars. Here we see the process by which certain aspects of El worship—such as horned altars and the sacrifice of cattle—were accepted into the worship of Yahweh, while others—such as the veneration of the bull-calf icon and the recognition of Baal as one of El's sons—were disowned. William Dever discusses another intriguing question in his book Did God Have a Wife? He presents archaeological evidence suggesting that the goddess Ashera was seen as Yahweh's consort in certain times and places. An echo of language associated with Ashera worship may be found in Genesis 49:25, which sates: "The Almighty (Shaddai)… blesses you with blessings… of the breast and womb." The Bible is clear that the Queen of Heaven was worshiped by families who also honored Yahweh in Jeremiah's day (Jer. 7:17–18). Dever suggests that Ashera worship remained widespread among the common folk, while the elites, centering on the male priesthood, fought to exclude any feminine portrayals of God. Eventually, many of the characteristics of Ashera were included in the rabbinic concept of the Shekhina. The Bible seems to indicate that even though the Israelites were forbidden to worship other deities, Yahweh was not considered as the only god who actually existed. The prophet Micah declared: "All the nations may walk in the name of their gods; we will walk in the name of the Lord our God for ever and ever" (Mic. 4:5). Yahweh is often referred to in the Bible as "the god of the hebrews" (there being no capitalization in the Hebrew text), thus portrayed as one of several tribal deities rather than as the only God in existence. The portrait of God acting as judge in the assembly of the gods has obvious parallels in other religious traditions: El is the chief of the divine assembly in Canaanite religion, just as Zeus is the head of the court at Olympus. Here, however, God has pronounced a sentence of capital punishment on the other gods. This parallels the viewpoint of Jeremiah 10.11: "The gods who did not make the heavens and the earth shall perish from the earth and from under the heavens." In this way the concept of Yahweh as the chief god begins to shift into that of Yahweh/Elohim as the only true deity, with other gods in the position of either demons or creatures of man's imagination. The four consonants of the Hebrew spelling of Yahweh are referred to as the Tetragrammaton (Greek: τετραγράμματον; "word with four letters"). It is spelled in the Hebrew alphabet: yodh, heh, vav, heh—YHWH. Of all the names of God, the one which occurs most frequently in the Hebrew Bible is the Tetragrammaton, appearing 6,823 times, according to the online Jewish Encyclopedia. In Judaism, pronunciation of the Tetragrammaton is taboo. Usually, Adonai ("the Lord") is used as a substitute in prayers or readings from the Torah. When used in everyday speaking the Tetragrammaton is often replaced by HaShem ("the Name"). According to rabbinic tradition, the name was pronounced by the high priest on Yom Kippur, the only day when the Holy of Holies of the Temple would be entered. With the destruction of the Second Temple in the year 70 C.E., this use also vanished, explaining the loss of the correct pronunciation. Beginning in the middle ages, the Tetragrammaton was widely contemplated as a tool used in mystical enlightenment, especially in kabbalistic literature, as well is in magical incantations and spells. In one mystical tradition, each letter of the 4-letter form of the Name represents a metaphoric symbol of the living power of God. 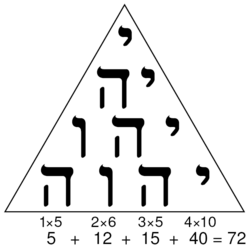 Also, when the letters of the Tetragrammaton are arranged in a kabbalistic tetractys formation, the sum of all the letters is 72 by Gematria—a rabbinic system of assigning a numerical value to each letter of the alphabet—as shown in the diagram. In another tradition, the mystical sacred name is actually 72 letters long and the high priest is said to have communed with the Almighty using this 72-letter name of God, which was written out on a long strip of parchment, folded and slipped inside the high priest's bejeweled breastplate. When someone would ask the high priest a question of Jewish law, the high priest could invoke the name, wherein according to lore the 12 jewels on the breastplate, representing the 12 tribes of the Israelites, would light up with the glory of God. The number 72 has a number of significances both scientifically and mystically. Besides being the product of 6 times 12 (the number of points on the Star of David times the number of the tribes of Israel), it is also the sum of four successive prime numbers (13 + 17 + 19 + 23), as well as the sum of six consecutive primes (5 + 7 + 11 + 13 + 17 + 19). It is also a "prone number," meaning the product of two successive integers (8 and 9). ↑ Amihai Mazar, Archaeology of the Land of the Bible (New Haven, CT: Yale University Press, 1992, ISBN 978-0300140071). ↑ Mark S. Smith, The Origins of Biblical Monotheism (New York, NY: Oxford University Press, 2003, ISBN 0195167686); Donald Redford, Egypt, Canaan, and Israel in Ancient Times( Princeton, NJ: Princeton University Press, 1993, ISBN 0691000867); Israel Finkelstein, The Bible Unearthed (New York, NY: Free Press, 2002, ISBN 0684869136). All links retrieved March 9, 2019. This page was last modified on 9 March 2019, at 17:27.